I have recently purchased a free-standing home safe from Burg Wächter (sometimes spelt Burg Waechter). The Pointsafe range comes in four sizes P1, P2, P3 and P4 and is available with an electronic pad lock or a key. I bought the electronic P2E version. The electronic version comes with two 'override' keys in case you forget the combination. Remember to store these keys securely, but not in your safe! The safe is rated for £1000 cash or £10000 jewellery, so is not a high security safe but sounds about right for the things I would store in a home safe (passport and other documents, a small amount of emergency cash and a backup of my photographs on disk). The P2E version has single skinned walls (3.5mm steel) and a double skinned door. There is an internal metal shelf, and the floor is felt-lined. The back and floor each have two holes for fixing the safe to a wall or floor with the supplied bolts, plastic blanking pieces cover the holes at the back. The door seems solid, with two locking bolts which extend 16mm when locked. The door hinge is visible at the bottom of the door - this may be a weakness. 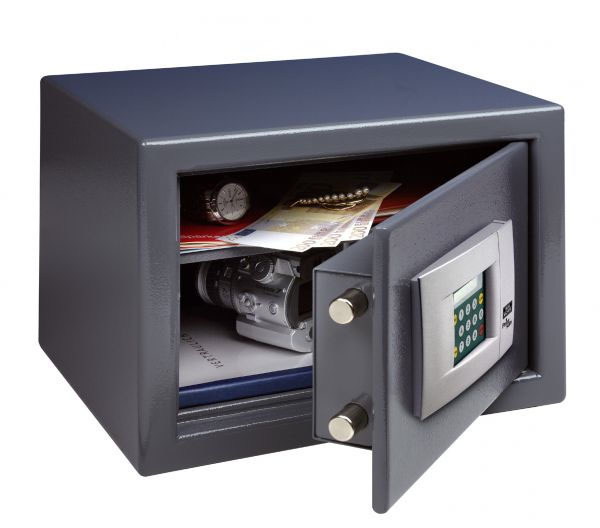 The external dimensions of the safe are 255(h)x350(w)x300(d), internally they are 248(h)x343(w)x241(d). The volume is 20.5l and the safe weighs 16.5Kg. The safe is large enough for A4 paper with a little room to spare, but you will have to bend it to fit it through the door. The keypad is responsive and makes a quiet beep when you press the buttons. The single line LCD display is not backlit so can be difficult to read, but you really don't need to read it when opening or closing the safe. When not in use, the display shows the current time. The bolts are driven by an internal motor rather than by turning a handle on the front - this should make the safe less susceptible to opening by 'bumping'. After entering the correct code, the spring-loaded door swings open automatically. The batteries (4xAA) are accessible from the outside of the safe, and the emergency keyhole is located behind them. The keys are four-sided cruciform keys which make the lock harder to pick and the keys harder to duplicate than a standard or tubular key. The safe comes with the batteries, keys and two fixing bolts hidden in the packaging - be careful you don't throw them out! The safe can also be set into 'hotel mode' which means a new user code needs to be entered in order to lock the safe if it is left open for more than 5 minutes. The default user code is 168 and default master code is 12345678 - these should both be changed as soon as possible. Update 18/03/2019 I still use this safe, although I don't open it often, maybe a couple of times a month. The original batteries are still in the safe and it seems to be working fine.